The first thing on your ‘to do’ list, after you purchase your home, is to fix those three broken tiles. Now where to start, how to get them out, without breaking any other tile? Follow these simple steps, and before long you will be having your first dinner party. 1 Pull a grout saw along the edge of the joint to remove damaged grout, but do not mar the tiles. Cut into the good grout slightly so the new grout can bind to a solid surface. These devices either have serrated teeth that you use like a saw or abrasive-textured blades. 2 Place painter’s tape along the edges of tiles you don’t plan to remove. This helps protect their edges as you remove adjacent tiles. 3 Insert the tip of a small chisel into the joint with the tip facing the broken tile you need to remove from the backsplash. Tap gently on the chisel with a hammer to loosen and remove the tile. If you have multiple tiles to remove, pop them all out in this manner. Some may break as you remove them. 4 Continue using the chisel to remove any thin-set mortar that remains on the substrate behind the tile. Wipe the substrate clean with a damp sponge. 5 Dry fit the new tiles into the openings. If the new tiles have spacers, you may need to remove them, using tile nippers, to get the tiles to fit. Smooth rough edges with a sanding stone. 6 Mix thin set mortar with latex additive until the thin set resembles mashed potatoes. Let the mortar set for a few minutes for any air bubbles to dissipate. 7 Apply the thin set mortar to the substrate with a trowel. Butter the back of each tile with the mortar as well, placing more thin set in the center of the tile’s back. Reset tile into position on the wall, taking care to keep joint lines straight and even. The tiles should be level with adjacent tiles as well. Allow the thin set to dry for 30 minutes before proceeding. Remove the painter’s tape. 8 Mix un-sanded grout with enough water to make the grout resemble mashed potatoes. Wipe the grout into the joints diagonally with a grout float. If you can’t push the grout into the joint with the float, push it in with your finger. Smooth the joints so they resemble the existing joints. Wipe off excess grout with the float. Allow the grout to dry for 10 minutes. 9 Wipe the tiles with a clean, damp sponge. If a haze develops, polish it off with a soft, dry cloth. 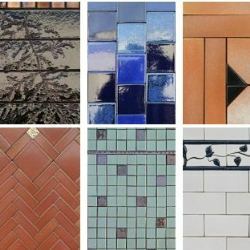 If completely replacing your backsplash tile is not in the budget, these repair steps will get you by!